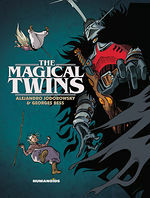 Largely avoiding the pitfall of the kind of forced morality that often turns such all-ages adventures into a total drag yet with just enough focus on team work and responsibility to keep parents looking for a positive message happy, this one is a total blast. 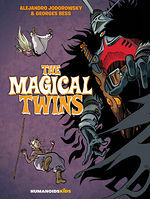 [Children] will love the beautiful illustrations, and exciting, action packed pages. The artwork by Georges Bess is very good, and he excels at some of the more hallucinogenic scenes written by Jodorowsky. The story includes a few clichés, but they are handled well. 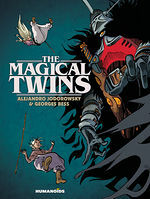 With its positive spiritual vision and Jodorowskian playfulness-in-the-face-of-death, The Magical Twins is a book to be enjoyed and learned from by readers of all ages. It is a fantastical, magical world we are plunged into, a ‘Once Upon A Time’ world that is beautifully ageless and, I dare say, will stand the passing of time.